What is a “Learning Commons”? It’s more than just another name for the Media Center or the school library. It is a flexible learning space for all students and staff to read, study, explore, create, collaborate, and learn. 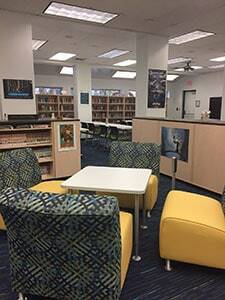 The Learning Commons supports the mission of Atlantic Technical College by providing access, support, and instruction to students and staff with a variety of current digital and print resources and tools. It is the mission of the Learning Commons staff to help students achieve academic excellence, become lifelong learners and readers, and develop the knowledge and skills necessary to be competitive in a global workforce. Monday 6:45 a.m. – 3:30 p.m.
Tues. – Fri. 6:45 a.m. – 2:30 p.m.
Students and staff may visit any time during these hours to check out books, read, study, research, collaborate, use the computers, etc. Magnet high school students should sign in at the circulation desk. Students may print from the computers – maximum of 30 pages per day for school purposes. A computer lab with 24 computers is available for class use. 8 computers and 30 laptops are available in the main room for individual use. Two MediaScape lounges can be reserved for 4-6 students to work collaboratively using laptops and shared, large screen monitors. Charging stations, study tables and comfortable seating are located throughout the facility. Recordex interactive computer/display system is available for presentations and instruction. The Learning Commons print collection includes a variety of fiction and nonfiction books; and a selection of magazines for informational and pleasure reading. A large, instructional area in the main room, which is a flexible space with 12 mobile tables that can be arranged in a variety of configurations or removed completely so that a maximum of 60 chairs can be set up, auditorium-style is available for individual, small and large groups. Destiny: Use the Destiny online library catalog to search for books and materials in the ATC Learning Commons. Gale Cengage Learning: Search for magazine, newspaper and reference book articles; image, audio and video files. Britannica School Online Encyclopedia: Access to articles, images, videos, websites, primary sources and more! For the home passwords to the databases, refer to the Online Resources Brochure available in the Learning Commons, Building 19. For more detailed information about Learning Commons policies and procedures, view the Learning Commons Orientation.